Savicom makes it easy for marketers to keep up with trends. With more emails opened and clicked on mobile devices than desktops, many marketers are adopting a “mobile-first” approach. We just released a BRAND NEW template library of 30 responsively designed templates for every occasion. 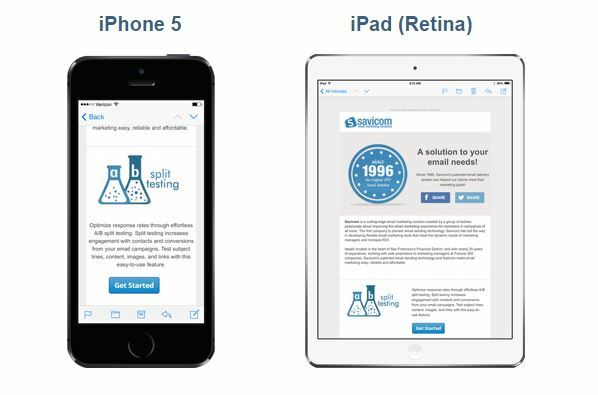 These templates were rigorously tested across all email clients and browsers and look great! Find your favorite style and design—and make it your own. To make it easier for your customers to contact you, we added a new insert option on the Content screen that makes phone numbers in emails dial-able on mobile phones with a single click. Check out the new Resources section on the Savicom website, including a blog, Best Practice guides and White Papers. We will add to this section regularly, so keep checking back. Don’t see a topic you’re interested in? Drop us a note and we will add it. Don’t have time to set up and get that campaign out the door? Vidi Emi (Savicom’s new parent company) is a full-service digital marketing agency ready to assist you with every aspect of your email marketing, from design, through set-up, execution and optimization. Find out more by contacting Savicom’s Customer Support.